What was it about the Bluetooth module that caused the Office programs to crash? Kudos to the hardware engineers, as it really wasn’t their fault. Not this time, at least. It was the guys on the software side of things. As part of the driver installation for this Bluetooth module, a piece of software called “WIDCOMM Bluetooth Software” is installed. This software helps to manage Bluetooth connections and features. One of those features is a “Send to Bluetooth” option in the Office programs. Theoretically, you can use this feature to send the document you’re working in directly to your Bluetooth connection. This may allow you to send it to another user, directly to a Bluetooth printer (those exist, right? ), or who knows what else. When I first deployed laptops with this issue (quite a few years ago, now), the most simple solution was to entirely uninstall “WIDCOMM Bluetooth Software”. Without the software installed, the “Send to Bluetooth” feature was no longer added to the Office programs, and Office stability was returned. With none of my users requiring the use of Bluetooth, uninstalling the module’s software didn’t cause any issues. Technically, the software isn’t even necessary to use Bluetooth. It just makes some aspects of Bluetooth use more convenient. Cut to a few months ago, when a user running a Latitude E4310 suddenly needed to use Bluetooth. Why the need for Bluetooth? Well, remember how I mentioned the convenience of Bluetooth when dealing with a limited number of USB ports? The E4310 only has two USB ports, both of which the user was using, but they wanted to add a wireless mouse to their setup. Typically, you’d connect a wireless mouse via a USB dongle, but since they were already using both USB ports, that wasn’t an option. One could always get a USB hub, but who wants to lug that around? So, this was the perfect opportunity to put a Bluetooth mouse to use. The laptop had Bluetooth built in, so why not? At first, I didn’t remember all of the issues with Office 2003 and Bluetooth, but they quickly came back to me. This time, though, I didn’t want to have to completely uninstall the Bluetooth software, so I dug a bit deeper and found a better option. Surprisingly, Dell still hasn’t updated their drivers with a fix for this issue. Simply change the LoadBehavior key to 0, for each Office program, and the random crashes will go away. To do so, double-click the LoadBehavior key in the right window, overwrite the value with a 0, and click OK. For those requiring more details, I’ll provide in-depth directions at the end of this post. 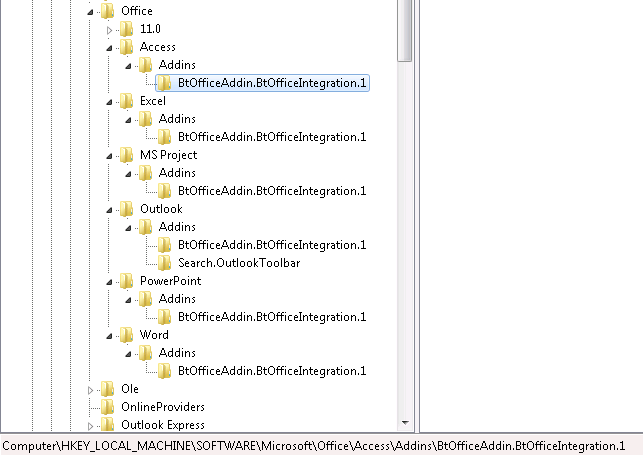 The easiest way to find the necessary keys is to search for “BtOfficeAddin.BtOfficeIntegration.1”. That should take you directly to each key you need to change. Make sure to hit the keys under the “Wow6432Node”, as well, if you’re running a 64-bit OS. Here’s a look at the keys I ended up changing. I also found a key for Visio, in a different area of the registry. So, using Find is probably your best bet for hitting all of the keys. Location of some of the keys controlling the integration of Bluetooth with Office 2003. There you have it. A relatively simple fix for an extremely annoying issue. I’ll soon find out if the issue carries over to Office 2010 and 2013, as I have a few such deployments coming up on the EXX10 series of laptops. It seems like it was just a bit of sloppy coding on the Bluetooth developers part, but you never know, it may turn out that Office 2003 was at fault all along. As promised, here’s the step-by-step directions for finding and changing the LoadBehavior registry keys. First, open RegEdit. To do so, click the Start button, then search for regedit in the search box. 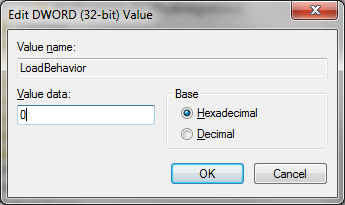 Alternatively, you can click the Run… button, and type in regedit.exe. Highlight “Computer” at the top of the folder listing in the left pane. Go to Edit, Find, type in “BtOfficeAddin.BtOfficeIntegration.1” (without the quotes), then click Find Next. Now close the Find window and press F3 to search for the next instance of the key, as needed. Not all keys will be appropriate. You want to look for keys located under known Microsoft programs, where a LoadBehavior key is present in the right pane. When you’ve found one of the correct keys, it should look similar to this. Double-click on the LoadBehavior key in the right pane, change the 3 to a 0, the click OK.
To disable the Bluetooth add-in, change the 3 to a 0, then click OK.
Continue to search for other instances of the BtOfficeAddin.BtOfficeIntegration.1 registry key, changing any located under an Office program’s Addins directory. When you’re done, simply close the Registry Editor. You may have to restart your computer to apply the changes. For those intimated by the Registry Editor, try this. Create a new .txt file on your computer. Right-click on your desktop, go to New, then Text Document. Right-click the file and choose Edit. Copy the appropriate chunk of code from below, paste it into your new file, save it, then close it. Double-click the file, read and respond to the security message that pops up, allowing the changes to the registry, and then you’re done. Here is a basic set of registry keys. These should disable the Bluetooth add-in in most Office programs. Here are the 64-bit equivalents of the keys above. If you’re running 64-bit Windows, then you should install these keys, in addition to the keys above. Create a new file with these keys, and run it separately. If you only want to disable the Bluetooth module in the most problematic application, Excel, just install the following keys. Again, create new .reg files for each set of keys. This entry was posted in software, drivers and tagged Office, software, hardware, drivers, Bluetooth by Dan Brust. Bookmark the permalink.